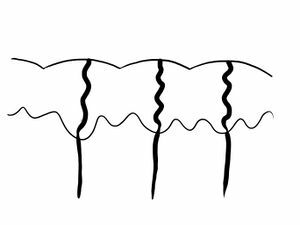 Description This chapter describes the dermoscopyThe examination of [skin lesions] with a 'dermatoscope'. This traditionally consists of a magnifier (typically x10), a non-polarised light source, a transparent plate and a liquid medium between the instrument and the skin, and allows inspection of skin lesions unobstructed by skin surface reflections. Modern dermatoscopes dispense with the use of liquid medium and instead use polarised light to cancel out skin surface reflections. criteriameasure of how well one variable or set of variables predicts an outcome of melanocyticThis glossary term has not yet been described. lesions in acralPertaining to peripheral body parts, especially hands, feet, fingers, and toes. sites. Acral, Melanoma, Acro-lentiginous melanoma, Parallel ridge pattern, Palms, Soles, Parallel furrow pattern, Diffuse pigmentation of variable shades of grey, Fibrillar pattern, Multicomponent pattern Acrolentiginous Melanoma – cite! Acrolentiginous Melanoma (message) Acrolentiginous Melanoma – participate! Anatomy of palmsThis glossary term has not yet been described. and solesThis glossary term has not yet been described. The unique appearance of the skin on palms and soles is due to the presence of alternating furrows and ridges, which are responsible for creating our individualized dermatoglyphic patternsThis glossary term has not yet been described. 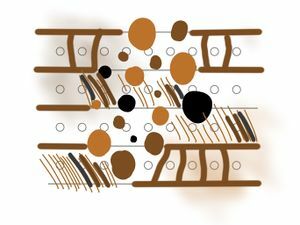 (fingerprints) The location of pigment in relationship to the furrows and ridges can helpRefers to giving assistance or support to others for mutual benefit in differentiating benignis any condition that is harmless in the long run neviThis glossary term has not yet been described. from melanomaThis glossary term has not yet been described.. DermoscopyThe examination of [skin lesions] with a 'dermatoscope'. This traditionally consists of a magnifier (typically x10), a non-polarised light source, a transparent plate and a liquid medium between the instrument and the skin, and allows inspection of skin lesions unobstructed by skin surface reflections. Modern dermatoscopes dispense with the use of liquid medium and instead use polarised light to cancel out skin surface reflections. helps more precisely localize the pigment and has been shownmto significantly improve the observer’s diagnostic accuracyThis glossary term has not yet been described. when evaluating volar melanocytic tumors. Numerous specific dermoscopic patterns have been defined for nevi and melanoma located on acral sites. In benign melanocytic tumors, the location of the pigment tends to favor the crista limitans, which corresponds to the furrows of the skinThis glossary term has not yet been described.. Recentresearch has revealed that acral nevi may be located at he tips of rete ridgeThis glossary term has not yet been described. sassociated with the crista intermedia and limitans; however, they preferentially transfer melanin to the keratinocytes associated with the furrow. In melanoma the malignant melanocytes tend to cluster around the crista intermedia, which in turn often results in pigment located on the ridges. Lesions on volar skinThis glossary term has not yet been described. that manifest any of the melanoma-specific structuresThis glossary term has not yet been described. (malignant patterns). 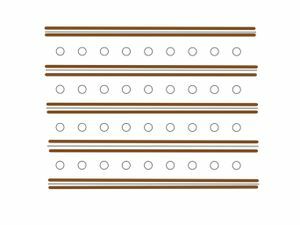 Parallel furrow patternVolar pigmentation forming solid or dotted lines, parallel, thin, on the furrows (sulci superficiales or invaginations in dermatoglyphics). 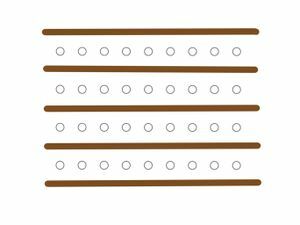 The lines are occasionally doubled, each line is beside the furrows. 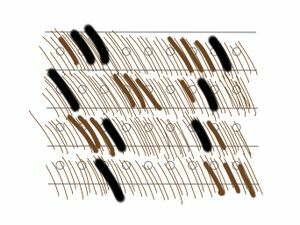 Linear pigmentation, predominantly localized to the furrows. The ridges are relatively hypopigmentedThis glossary term has not yet been described.. 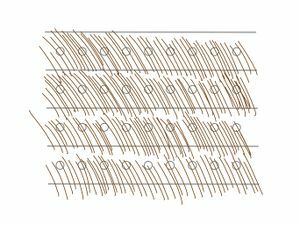 Similar to the parallel furrow patternVolar pigmentation forming solid or dotted lines, parallel, thin, on the furrows (sulci superficiales or invaginations in dermatoglyphics). 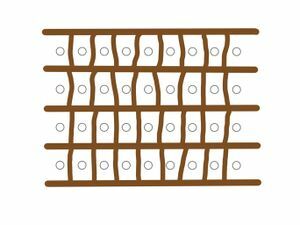 The lines are occasionally doubled, each line is beside the furrows. 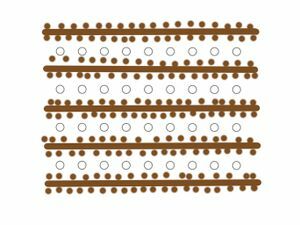 with the addition of parallel pigment bands that cross over the ridges from one furrow to the next.Pattern can chow some dotsDots are small, round structures of less than 0.1 mm in diameter that have a red color when corresponding to blood vessels; however, when due to melanin, their color ranges from black, brown, to blue-gray depending on the depth and concentration of the melanin in the skin (Tyndall effect). Linear pigmentation of the ridges. The furrows are relatively hypopogmented. 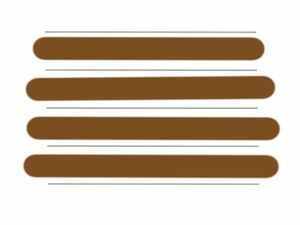 Diffuse pigmentation of different shades of brown color not respecting furrows or ridges. A fibrillar pattern that is very heterogeneous, that is asscociated with another malignant pattern, or that is not located on the areas of the foot bearing the body pressure is called atypical fibrillar pattern. This should be considered with precaution. Presence of reddish whitish colorsThis glossary term has not yet been described.. This is mainly seen in thick tumors when there is a nodular component which is vascularized. Most of the time this part is raised or even nodular and and associated with a multicomponent pattern. 1 pointThis glossary term has not yet been described. is required to make the diagnosisis the identification of the nature and cause of a certain phenomenon. Diagnosis is used in many different disciplines with variations in the use of logic, analytics, and experience to determine "cause and effect". In systems engineering and computer science, it is typically used to determine the causes of symptoms, mitigations, and solutions of melanoma. ↑ Braun et al. 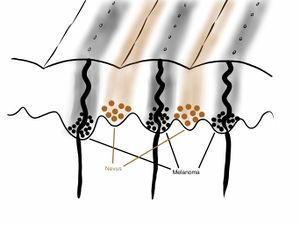 : Dermoscopy of acral melanoma: a multicenter study on behalf of the international dermoscopy society. Dermatology (Basel) 2013;227:373-80. PMID: 24296632. DOI. ↑ Phan et al. : Dermoscopic features of acral lentiginous melanoma in a large series of 110 cases in a white population. Br. J. Dermatol. 2010;162:765-71. PMID: 19922528. DOI. ↑ Lallas et al. 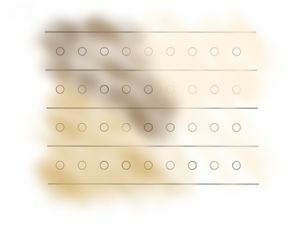 : The BRAAFF checklist: a new dermoscopic algorithm for diagnosing acral melanoma. Br. J. Dermatol. 2015;173:1041-9. PMID: 26211689. DOI. This page was last modified on 17 January 2018, at 20:40.